We employ our in-house SOLID/WORKS systems and extensive in-house tooling capabilities to create perfect prototypes for metal products. 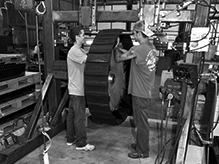 Once in production, our metalworking machinery and supporting equipment efficiently tackle runs from a few products to millions. We aim to achieve highly accurate tolerances that surpass specification requirements, while also eliminating waste to maximize profits for our customers. T&D is Quality ISO 9001:2008 certified. We offer the confidence that your product meets all specifications and will perform as expected. Raising the quality of standards to better serve our customers.